NEW YORK, June 5, 2014 The FADER, the definitive voice of emerging music, today announces the release of its annual Summer Music Issue. 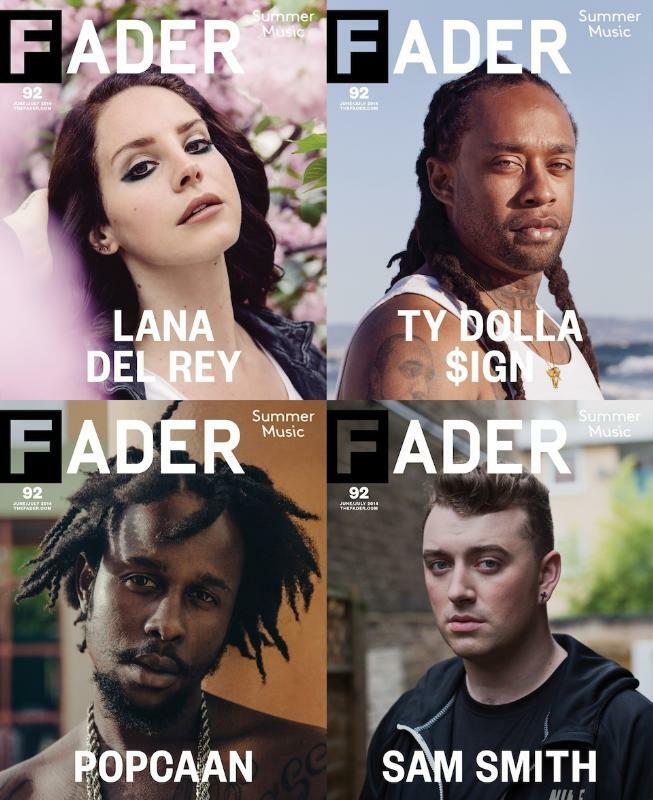 In the publication’s 92nd issue, The FADER has expanded its usual two cover artists per issue to four, documenting musicians Lana Del Rey, Sam Smith, Ty Dolla $ign, and Popcaan in exclusive, revealing interviews, available now at TheFADER.com. The four cover stories from this issue are available to pre-order here and online in their entirety. Included in the issue is a touching interview with singer-songwriter Sam Smith in his first cover story, written by The FADER executive editor Jessica Robertson from a hotel room in West Berlin. In this exclusive interview, ahead of the release of his debut album In The Lonely Hour, Smith, for the first time, opens up about the inspiration behind his music. In The FADER’s 92nd issue, the 22-year-old Smith discusses his recent brush with his first love, and how his debut LP is about a man that he fell in love with last year, who didn’t love him back. Also from this issue, The FADER senior editor Duncan Cooper spent time with Lana Del Rey for what has become one of her most revealing interviews yet. The artist, whose debut album has sold more than Beyoncé’s last two albums combined, and whose second major-label album, Ultraviolence, is only a couple of weeks away from release, opened up about her once bristling critics that led to a severe dark period in her life, the support of her billions of fans, and her mixed reviews on feminism. Also in this issue, writer Julianne Escobedo Shepherd spent time in Fresno, California with the burgeoning R&B superstar Ty Dolla $ign in his first solo cover story in the midst of his first headlining tour, The Beach House Tour. On the heels of his track “Paranoid” going gold, Ty opens up about childhood, his music, and his daughter, Jailynn. On The FADER’s fourth cover, writer Jesse Serwer flew to Jamaica for an unruly week with dancehall’s brightest artist, Popcaan. Celebrating its 15th year, The FADER has long been recognized for providing in-depth reporting, aggressively covering the most dynamic breadth of topics and bringing some of the most underground artists to the forefront of the mainstream. The FADER is credited for giving early exposure to top artists, including Kanye West, Bon Iver, Frank Ocean, Kendrick Lamar, Outkast, The Strokes, Drake and The White Stripes. The FADER’s Summer Music Issue is on newsstands July 8 and available to pre-order now. Launched in 1999 and founded by Rob Stone and Jon Cohen, The FADER is an award-winning, ahead-of-the-curve, music, style and culture publication and the unofficial guide to what’s next in music. Led by President and Publisher Andy Cohn, The FADER is credited with giving early exposure to top artists including Kanye West, Bon Iver, Kendrick Lamar, Outkast, The Strokes, Drake and The White Stripes. The FADER brand has expanded in innovative ways, providing a cross-platform reach across print, digital, experiential, mobile, and social media realms. The FADER and its network of partners speak to a combined audience of 2 million influential young adults monthly, and include Insound, Afropunk, 1200Squad.com, Oh My Rockness, and The Cornerstone Mixtape.